When it comes to athletic gear, the focus is often on designing a better shoe. But advancing the technology of sports product design might instead be in the palm of your hand. 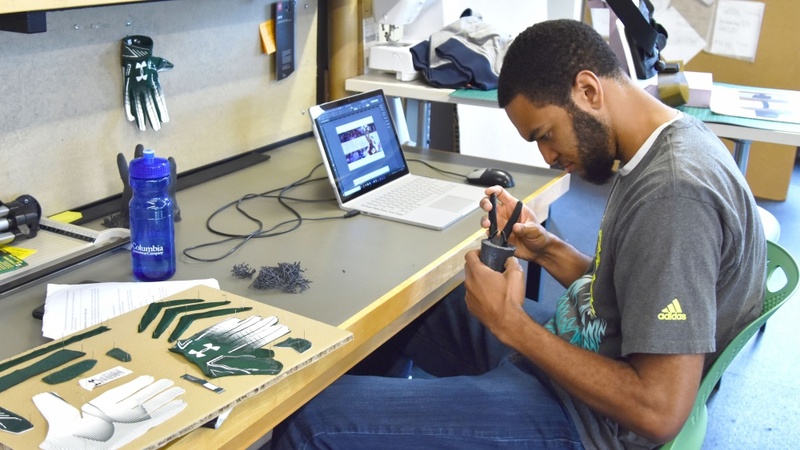 Students in the University of Oregon’s sports product design graduate program in Portland are busy designing gloves after using 3D scanning and printing technology to create life-size models of their own hands. One student, Natasha Anand, said access to this technology brings the opportunity to make the world of sports a more equal place through design. “Everyone’s body types are different, so being able to create a product that addresses everyone’s needs is really important,” Anand said. Fellow classmate Gary Corr helped come up with the procedure for the project before the term started. The students began by putting dots on landmarks of their hands — like the tips of their fingers and the crevices between them — then placed their hands against a plexiglass surface while a camera moved around to fully capture them in thousands of different shots. The landmarks showing the dimensions of the hands would show up in the 3D modeling program they used to make final adjustments before sending the scans to the 3D printers. Susan Sokolowski, director of the graduate program and an associate professor of product design, said the technology helps the students better understand the hand and glove fit. The glove project is part of a sports equipment studio taught in the second year of the program. James Tuttle has been working in the program’s lab this term, setting up the 3D printing machines to recreate the students’ hands. “These are very precise,” Tuttle said. Inside each clear orange box of a 3D printer, a laser beam solidified one thin layer of flexible resin at a time. After 40 hours, the layers had come together to form a solid replica of one student’s hand. Corr said designing a glove to specifically fit a model of his own hand, with every unique curve and bend, will allow him to produce a better product. “We’ll actually be able to test the gloves ourselves to see if they’re too lose or too tight and to see how we can move in them,” Corr said. The students each chose a different type of glove to redesign. Kiersten Muenchinger, associate professor of product design, said she’s excited about the level of invention the students in the graduate program are involved in. Kevin Hawkins, who is redesigning gloves meant for catching footballs, said his project comes with challenges. The gloves not only need to aesthetically fit with a football team uniform but also be functional to allow the receiver to grip a wet football in the rain. Using his past experience as a bicycle motocross racer, Nick Cantrell is redesigning a glove meant for the sport. Meanwhile, Cherry Chan is busy creating an auto racing glove that will not wear down too easily in the places where it rubs against a steering wheel. Chan said the project is giving her a deeper understanding of the process of sports equipment creation. “The prototyping process helps us learn about the flow of manufacturing and the techniques that are essential in sports product design,” Chan said. Olivia Echols disassembled her military glove into 43 separate pieces to examine each piece. She described the original glove as rugged-looking with material that seemed cheap. “I’m using this information to redesign it for more simplicity and better performance,” Echols said. She said military gloves like these are often built for men, but she’s interested in designing items for women. Using the 3D model of her own hand, Echols is planning to redesign and construct a higher quality military glove for women. According to Echols, the graduate program has an emphasis on innovation through making, and the glove project fits in perfectly with that. “We can make a ton of sketches, but it’s not until we actually try to make something that we realize it doesn’t work or that there’s a better way to design it,” Echols said.